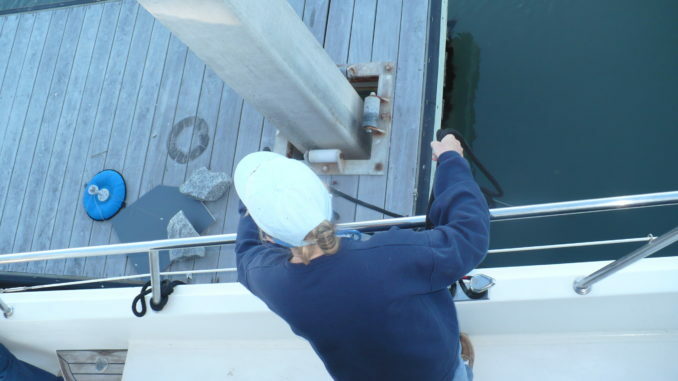 Because you have already received the first three emails in our FREE Docking series you are familiar with the role of wind and current, proper preparation and crew readiness. Let’s put them together and we will notice one more consideration for Perfect Docking…but No Jumping Please. In the video below we see this single engine Cape Dory starting his glide. Please notice a few things- fenders are deployed, the mate is ready with lines and there is a favorable wind and current. Also, they called ahead using their VHF so the marina staff would anticipate their arrival and assist with lines. 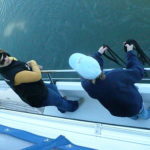 Sometimes we are not so fortunate and we must handle lines without any help from the dockside. More on that in a moment. Without a thruster to assist, the helmsman plans to dock into or against the current which is stronger than the wind blowing from the opposite direction. Practice running your boat at slow speeds both with and against a current and you will understand just how much throttle you need to maintain steerage and control of your boat. 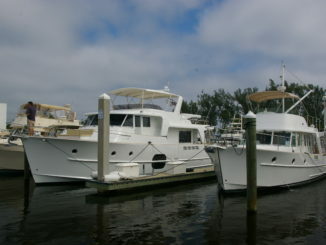 So with proper preparation, practice and patience the boat glides into the assigned dock space. 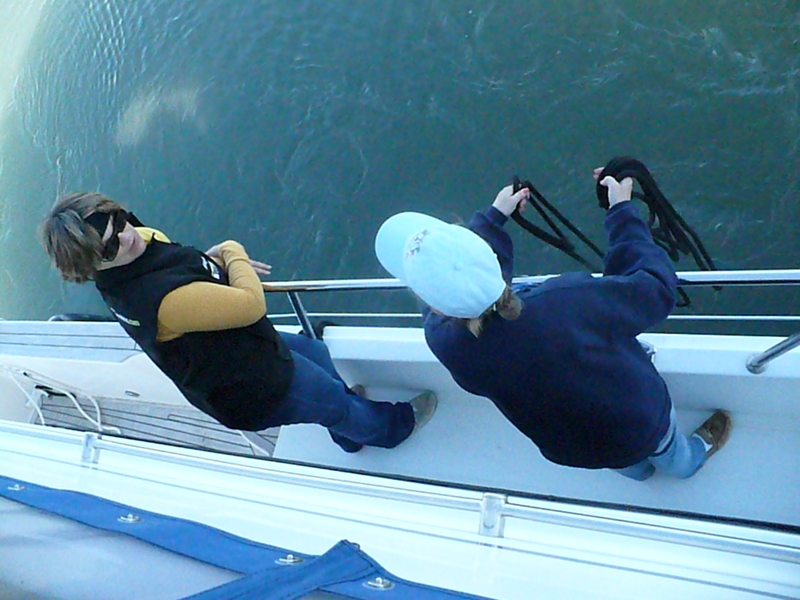 A little reverse to slow the forward momentum and the mate can literally hand off a line to the dock master. As you watch this video below, take a moment to think about what you could do if no one was there to catch your thrown lines…and no jumping please! 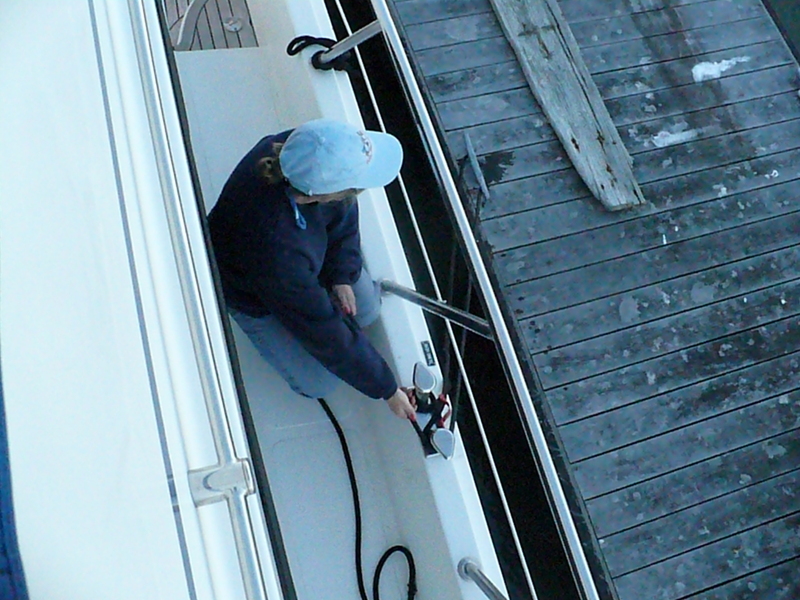 In our 60 minute Docking DVD we detail the task of securing a line to the dock without any assistance from marina staff. It’s often done with a mid-ship breast line but sometimes we make our first line a stern line and do a door hinge maneuver. 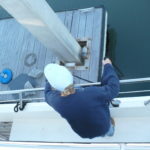 The still photos here show one method of readiness to manage dock lines without jumping from the boat. When the last line is secured and we have a moment to breathe we are treated to a lovely display of nature. 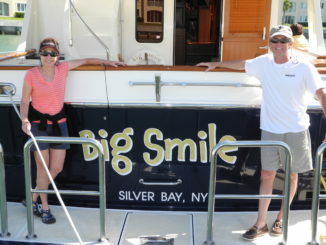 Dolphins accompanied this boat in to the marina and they gracefully welcome our newest arrival. Stay tuned for our last FREE Docking Tips email tomorrow. 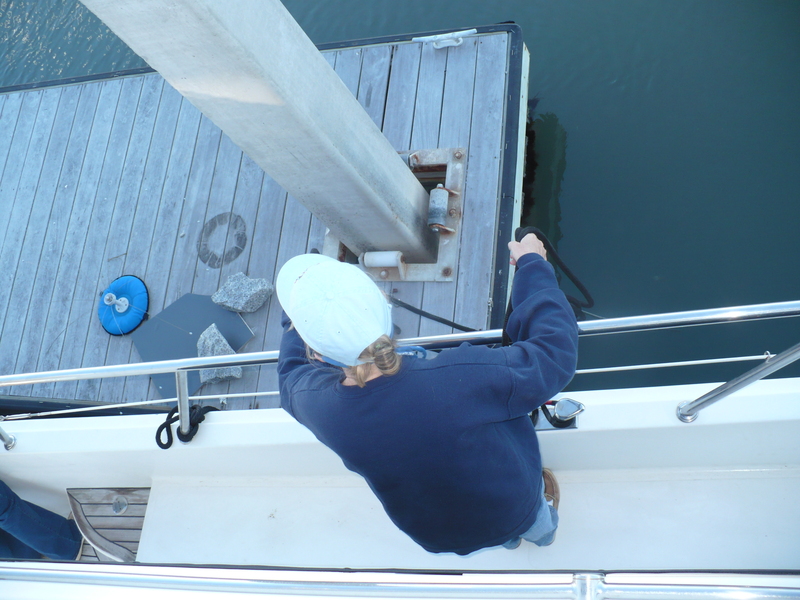 After receiving all five Docking Tips if you’d like more details, consider ordering our 60 minute Docking Training Video….or Ask Captain Chris!